"What's for dinner?" I have a love-hate relationship with that question. On the one hand I enjoy cooking and feeding delicious meals to my family, but on the other hand, I often find myself at a loss for what to cook. Sometimes it feels like we eat the same things over and over and over again, which can be boring and uninspiring. When I feel uninspired it's hard to find the motivation to cook. This often leads to unnecessary trips through the drive through, which can be bad for the budget and the diet. 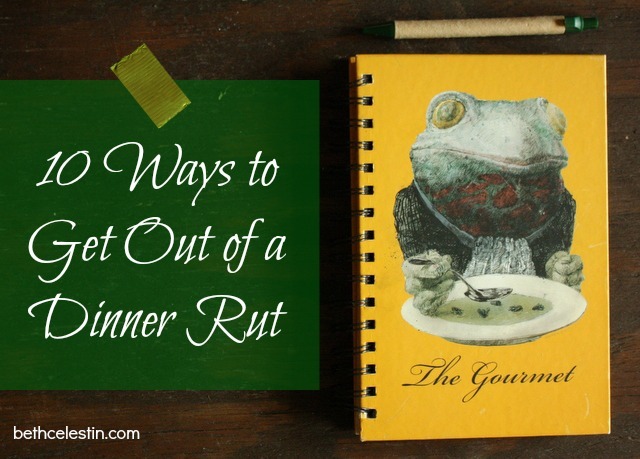 When I see myself heading for a rut, there are several things that help to rekindle my excitement for menu planning, cooking, and serving delicious meals to my family. I hope you find these helpful to. Start with the meals that you and your family actually like. Have everyone in the family give a list of at least three meals that they would like to see on a regular dinner rotation. Keep that list handy and add to it as new favorites arise. When you're planning your weekly menu. consult the list for ideas. I try to pick at least one family favorite every week. Seeing my family members excited about "what's for dinner" makes all my effort in the kitchen worthwhile. This is one of my favorite ways to gather new dinner ideas. Think about your family's favorite restaurants. Visit the websites of those restaurants and locate their online menus (most will have them available). Look through to see if anything sounds appealing. Once you've gathered some ideas, search online to see if you can find Copycat recipes or healthier versions of the recipes. With all of the food blogs and recipe sites available online, it's likely that you will have no trouble finding recipes comparable to your restaurant favorites. I think the saying is true, "You eat with your eyes first." Beautiful pictures of food can spark cravings like nothing else. Websites like Tastespotting, Foodgawker, and Healthy Aperture offer ever-growing collections of the best food photography from around the web, updated daily. Clicking the photos on any of the websites mentioned above will take you directly to the blog post or website where the recipe for that particular food is located. It's like a virtual buffet for your eyes! This is probably the easiest way to get a flood of dinner ideas headed your way. People, in general, love to be helpful and give advice. A simple status update requesting new and exciting dinner ideas/recipes is a surefire way to get out of a dinner rut! If you struggle with variety in your menu planning, giving each night of the week a theme may be a helpful solution for you. Some examples of themes include Meatless Monday, Italian Tuesday, Seafood Wednesday, Mexican Thursday, Pizza Friday, Slow Cooker Saturday, Soup & Sandwich Sunday, etc. I like to think of this method as a no-brainer method of menu planning. It sets you on a quick and easy path to a variety of weekly dinners. Stay tuned for five more ideas later this week!